Both dial and digital indicators have contact points. What is a contact point? It is essentially the point of interaction between your part and your tool. It is one of the most important parts of an indicator and comes in a great array of types. Depending on your current needs, these contact points can be replaced or altered in various ways. Let’s find out more about the different types of points (varying by shape) that indicators have. These points are typically used on convex surfaces, especially when they feature shallow grooves. These points are suitable for measuring narrow groove diameters. These points feature a conical shape that makes them ideal for positioning measurement points. Without proper care, these points can damage a workpiece. You should avoid measuring soft materials with them. These points have a large radius. They are often used on flatter surfaces. These are the most standard shapes for contact points. They work well with workpieces that feature deep indentations. These spherical points also have a large radius. They are great for measuring workpieces that need to be slide from side to side. Also known as wide face flat contact points or flat button points, this option works great on convex surfaces. These points come in handy when you need to probe the bottom of a hole or groove. These roller shape contact points are best suited for moveable workpieces. Works similarly to spherical points. There are situations where you need to use an extension for your indicator’s contact point. Depending on the distances or the parts you need to measure, as well as the availability of tools, extending the contact point can prove to be a life-saver. Contact point extensions may range between ¼” and 8″. Additionally, they do not add too much to the overall cost. 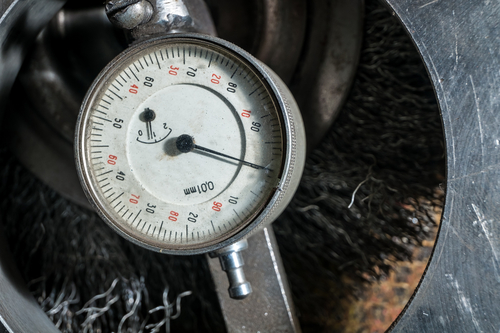 In order to achieve measurement precision, the extension you are using must be compatible with your particular brand of dial or digital indicator. Contact points come in an array of materials as well. Today’s materials include steel, plastic, ruby, and carbide. Carbide is currently the most used contact point material for digital and dial indicators. Ruby comes with great resistance to corrosion and compression strength. They work well on delicate parts. If you require a more durable option, carbide contact points are recommended. They offer long-term economic benefits and also possess unmatched compressive strength. As you can see, each contact point shape has its respective purpose. It is imperative that you choose the correct contact point type for your indicators so that you can always take accurate and precise measurements. The Willrich Precision team can help you choose an appropriate contact point for your application. Contact us today for more information!